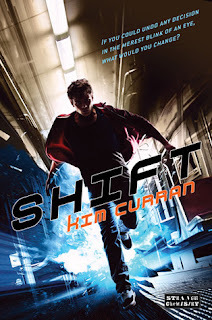 I really enjoyed shift and found it to be an easy and engaging read which I finished in one sitting (only pausing briefly to change trains). I loved the main character and the ideas behind the book and an thoroughly hoping that I won't have to wait too long for another instalment of what promises to be a fab series. I really enjoyed Scott as a character. I thought it was a fab anti-hero in that he was just a very average teenage boy which I think is something that will really appeal to teens. He isn't super clever, he isn't super fit or strong yet he really steps up to the mark when he needs to which makes him really cool. I also think there is a real lack of YA books with a male protagonists so this book made a nice change. I also loved Aubrey, the mysterious and quirky girl he meets and changes his life and thought she was really cool. I loved the relationship between the two of them and loves seeing them bounce off one another. All in all a fab and refreshing different read from a British author whom I want to read more from! Ooh, I've picked this one up to read next, it sounds really interesting!